The former Japanese Army air base in Chiran serves as the main source for this book's loose collection of stories about individual kamikaze pilots. Although the book targets children in upper elementary school and above, the book's many technical terms and personal interviews on a little-known historical topic will make it difficult for most children to make it to the end. Ochiho Shimahara has translated several Russian children's stories into Japanese, but Shiroi kumo no kanata ni (To the distant white clouds) is her first book as an author. After a short introduction on World War II and Japan's special attack corps, the first three chapters cover the author's two-day trip to Chiran to visit the museum and to interview several people. Chapter 4 tells several stories from Reiko Akabane (maiden name of Torihama) and Shōko Nagasaki (maiden name of Maeda), who met many kamikaze pilots when they worked at Chiran Air Base with other local high school girls during the early spring of 1945. 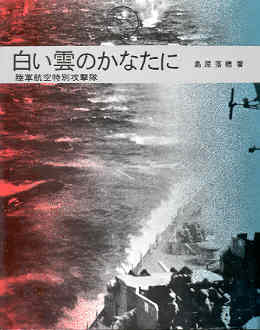 The next five chapters each give the history of a kamikaze pilot who sortied from Chiran. The final two chapters tell the story of Tadamasa Itatsu, the first director of Chiran's museum dedicated to kamikaze pilots. He went around the country to talk with bereaved family members, and during these many trips he collected photos, letters, and other artifacts that became part of the displays at the Chiran museum. Interviews and trips by the author fill this book. This approach works well for the first three chapters as an introduction to the small town of Chiran and its wartime history, but other chapters at times become difficult to follow as the number of different people and places increases. Although some parts of interviews effectively convey emotions and opinions of interviewees, many of these conversations do not present historical material in an organized fashion. The chapter on Ryōji Uehara is one highlight of this book. Shimahara goes to Nagano Prefecture to visit his younger sister Kiyoko, and the author finds out that all three of Kiyoko's older brothers died in battle. Ryōji Uehara wrote eloquent letters prior to his death, and he expressed his strong belief in liberty and hatred of Japan's totalitarianism. Although Kiyoko did not hear these words directly from Ryōji during his trip home right before his kamikaze sortie, he spouted off many radical ideas and seemed to be saying by his words, "Japan will lose. My dying in battle is not for the country. It is to protect people important to me. Since I'll be going to heaven, I'll not be at the Yasukuni Shrine" (p. 122). This book introduces several kamikaze pilots and contains many historical photos, but the lack of focus inherent in long interviews makes this book difficult to read, especially for children. The chapter on Ryōhei Hasebe, who did rozashi (needlepoint embroidery on a woven silk gauze canvas) in the Chiran barracks prior to his kamikaze sortie, provides a good example. The chapter starts promisingly with his unusual interest in rozashi and also includes the four last letters he wrote to his father, mother, older sister, and younger sisters. However, the rest of the chapter lacks focus with many long interview quotes and a few abrupt shifts in topic.